This past weekend, I hit a new PR on hang cleans at 225 (which, for the internet, is probably not all that impressive). While I’ve posted the video, what you can’t see is how after my reps I walked around an empty gym high fiving walls, fake people, and screaming the lyrics to Luke Bryan. True story. But, it made me realize that I don’t talk about Olympic lifting on here, even though I do the lifts very often. So why do I stay quiet about it? Well, for the majority of adults, Olympic lifting just doesn’t make sense (yup, I’m looking at you, Crossfit). While posting this video will undoubtedly make me the envy of all Bostonian men, it’s important to view in order to see all the moving parts in an Olympic lift. I’ve always thought of these lifts as being similar to a recipe. An individual needs to display a ton of knee stability, hip mobility, t-spine mobility, as well as shoulder and elbow mobility. Sadly, through the aging process and our sedentary culture, not everyone has all the proper ingredients! 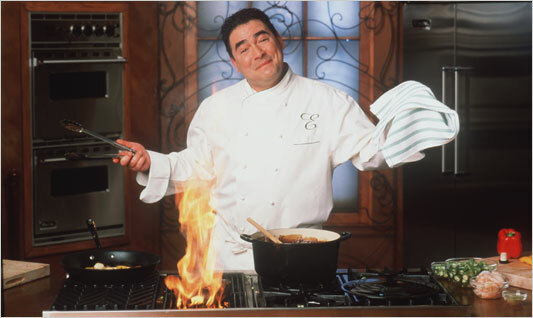 If Emeril is manning a stove, somehow I won't be concerned about an open flame.. Thinking about the Olympic lifts as a recipe also makes you realize that while they might be nice to have, they’re not a necessity in any program. Would it be nice to have Emeril’s recipe for gumbo? Yes. Could I still make a pretty amazing gumbo by myself? Of course I can, and Lindsay, my girlfriend, can vouch for that. The same goes for any exercise. Never think of any particular lift as being necessary to your success. There are hundreds of variations which will give you the same training effect. Furthermore, with certain people, particular exercises just do not make any sense. Not everyone has to do squat, deadlift, or bench in the traditional sense. But am I going to find a way to get in these lifts in a way that’s safe for them and pain free? Abso-frikken-lutely. Olympic lifts are a great tool in the proper setting, but that’s just what they are – a tool. If I have an adult who has a cranky back, cranky hips, or cranky anything, we are not going to Olympic lift. In every exercise I pick out for my clients to perform, there has to be a risk/reward that’s clearly in our favor. Sad to say, for most people Olympic lifting is simply not worth it.